While small businesses have always been a critical engine of growth for urban economies, new business startups have slowed nationwide in the wake of the Great Recession. In the city of Detroit, expanding small businesses means confronting the particular obstacles faced by black, Hispanic, immigrant, and female entrepreneurs. Enter the Entrepreneurs of Color Fund, a collaboration of the Detroit Development Fund, JPMorgan Chase, and the Kellogg Foundation. Launched in 2015, the fund provides loan capital to Detroit's entrepreneurs of color and to small business leaders who primarily hire local residents. Michael Barr, faculty director of the Center on Finance, Law, and Policy and one of the main architects of the fund—with U-M alumni James Wahls (BA '03, JD '06) and Paul Brown (BA '96, MBA '08)—notes that many minority-owned businesses launch with less capital than their counterparts, since they have to rely more on personal wealth and usually have less of it. In Minority and Women Entrepreneurs: Building Capital, Networks and Skills, a 2015 report for the Brookings Institution, Barr writes that minority-owned businesses are three times as likely to be rejected for a business loan than their counterparts. "The capital gap certainly comes [in part] from discrimination," he says, "but a second problem is lack of internal wealth. The less wealth you have, the harder it is to get access to credit," he says. Because the fund has a built-in loss reserve, which enables lenders to cover potential losses, it can provide capital to small businesses that might not typically qualify for loans. 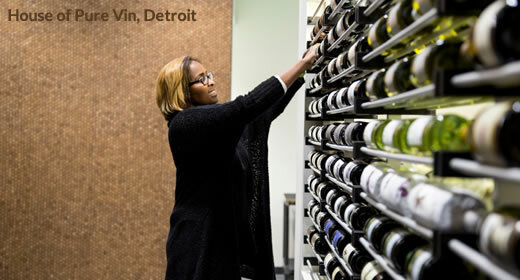 To date, the Entrepreneurs of Color Fund, run by Ray Waters, president of the Detroit Development Fund, has disbursed loans ranging from $50,000 to $150,000 to a growing number of Detroit entrepreneurs including House of Pure Vin, a wine shop and tasting room, and Love Life Swagger, a lifestyle streetwear brand. Yet, access to capital is just one critical component needed to launch a successful small business, says Barr. Entrepreneurs also need access to business networks and specialized technical skills. To help minority-owned businesses access these resources, Barr has partnered with Alicia Alvarez, director of U-M's Community and Economic Development Clinic, plus Michael Gordon and Jerry Davis from the Ross School of Business, Hannah Smotrich from the Stamps School of Art and Design, and Michael Wellman from the College of Computer Science and Engineering to create the Detroit Neighborhood Entrepreneurs Project. This fall, four clinic law students, under the leadership of clinical fellow Dustin Marlan, will help Detroit business leaders with incorporation, intellectual property concerns, purchasing and leasing facilities, and more. The other schools and departments will begin folding in faculty and student support over time. While Barr notes that the Entrepreneurs of Color Fund comes at an exciting time for Southeast Michigan, he believes there's more work to do to create a productive environment for small businesses in Detroit and other cities. At the local level, Barr says the city needs to streamline the small business permitting and licensing process; at the federal level, he hopes that the New Markets Tax Credit, which makes funding available to small businesses in low-income areas, will be reauthorized and expanded. Ultimately, he says, the goal of the Entrepreneurs of Color Fund is to give local leaders the tools they need to grow. Although start-up ventures are inherently risky, successful small businesses ground a strong local economy, he says. "If it works, you'll see more business formation, more sales, more employment—and that's going to benefit the community."